Motorola Moto E Vs Micromax Unite 2: Which One is Best in Rs 7,000? Micromax recently launched its new Android Kitkat smartphone “Micromax Unite 2″ in India and besides Motorola also launched its smartphone Moto E with the nearly similar cost as of Micromax Unite 2. Both of these smartphone are available in the cost of Rs 7,000 (approx). Generally, everybody has different choices but on the basis of the features of the smartphone, such as display camera and more you can distinguish these smartphone. Micromax Unite 2 has 4.7 inch display and Motorola Moto E has 4.3 inch display. So, in case of display size, the Unite 2 smartphone is good. 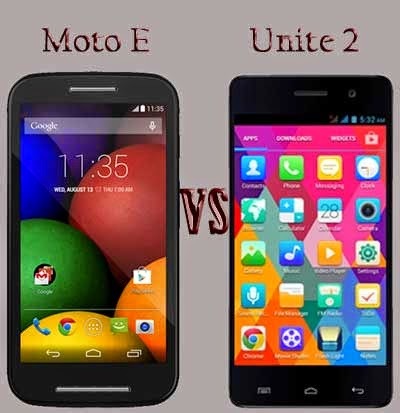 Unite 2 gives 480×800 pixels resolution and Moto E provides 540×960 pixels resolution. That’s why Moto E has good display quality. But with extra 0.4 inch screen, the resolution of 480×800 is not bad also. Moto E comes with Corning Gorilla Glass 3 protection feature that provides the better screen protection than Micromax Unite 2. Corning Gorilla Glass 3 protection can be proven excellent feature in just Rs 6,999 only in India. Another big difference found in the processor. The Motorola Moto E 1.2 GHz dual core processor whereas the Unite 2 has 1.3 GHz quad core processor. So, the dual core might seem old in the age of Octa Core, but still the quad core may give a nice experience to users. Both of these smartphones are come up with 1 GB RAM. In addition the MOto E smartphone also has Adreno 302 400 MHz Single Core graphics card. Unite 2 also has Mail-400MP2 GPU graphics card. Both smartphones gives the good features in case of graphics card. But Adreno 302 of Moto E may be proven very nice for high resolution games. Both of these smartphones work on Android 4.4.2 Kitkat operating system. However, Moto E claims to provide regular software updates for your operating system. Another big difference in these both smartphones is the camera feature. Actually, Moto E doesn’t have LED flash and front camera but Unite 2 of Micromax has both these features. Both of these smartphones are come up with 5 MP rear camera. Unite 2 of Micromax has 2000 mAh battery capacity that will give the talk time of 8 hrs and stand by talk time of 190 hrs- according to company. Whereas Moto E has 1980 mAh battery capacity but by mix media use, it can give 24 hrs f battery backup- according to company. In the matter of battery backup Moto E can precede the Unite 2 smartphone. However, both these smartphones are worth buying on seeing the battery features. If your choice is a durable smartphone that can resist when little water sprinkled on the phone. Additionally, the full enjoyment of gaming can be taken and battery goes on for long time, then Moto E is made for you! On the other hand, if big screen, quad core processor and camera with LEF Flash and front facing ability, then you’re indirectly searching for Micromax Unite 2 smartphone.